The Gap Analysis Matrix is a specialized Relationship Matrix that is used to record the gaps that exist between two versions of some part of an enterprise. The gaps between two different version of an architecture could be recorded, or the gaps in two versions of Capabilities or Staff Competencies, or two versions of Information or Data. The tool is structured like a spreadsheet with columns and rows. The elements that make up the baseline (starting point) are listed as columns and the elements that make up the target (end point) are listed as rows. There is a column for recording missing or eliminated elements and a row for recording new elements. At the intersection of a baseline element and target element notes can be added that describe any details of the relationship between the two elements. 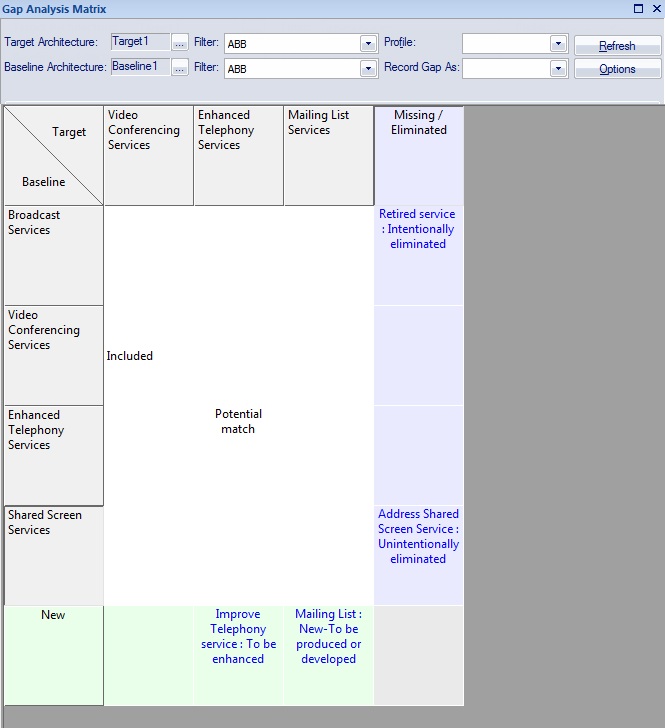 The Gap Analysis Matrix can be used for both business and technical analysis. It is a general purpose tool for recording the details of a comparison between different versions of some part of an enterprise. In business analysis it can be used to analyze Staff Competencies, Data and Information, Business Processes, Lines of Business and more, comparing them between current and future states of an enterprise. In Enterprise Architecture the matrix can be used to record gaps between baseline, transition and target architectures, comparing Capabilities, Architecture and Solution Components and more. The Gap Analysis Matrix can be configured to display different parts of the repository. Once the appropriate packages have been chosen for the Target and Baseline and the types of elements have been selected for the filter the Gap element type can be selected. The element chosen for the gap will restrict the available elements to represent the gap for Missing or New elements in cells in the matrix. There are a number of choices available from the 'Options' menu, including being able to update, delete and save the Gap Analysis Matrix, giving it a name so that it can be recalled at a later time.